Interested in a West Palm Beach vacation? I was curious about the Florida coastline, so for my first trip to Florida outside of Orlando, I checked out the Palm Beaches area north of Miami. Um, it’s kind of ok here. Maybe I should venture beyond Disney more often! I stayed at Marriott Oceana Palms, which is a Marriott Vacation Club property. I knew I’d be happy with the resort, as I’d absolutely loved my stay at the Marriott Vacation Club in Boston, and recommend it every chance I get. However, when many parents see the words ‘vacation club’, they think it must not be for them…they either assume they can’t book if they’re not a member, or worry they’ll be pitched to once on site. I can assure you: Marriott Vacation Club isn’t your grandparents’ time share. This points-based vacation ownership program is completely different, with tons of flexibility. However— and this is the kicker —you don’t need to be a Marriott Vacation Club owner to book Marriott Vacation Club villas, anyway. Quite honestly, this is one of the best ‘think outside the box’ alternatives to booking standard hotel rooms. For the cost of one beachfront hotel room (usually with a square footage of under 400), families can reserve an entire two-bedroom villa with over 1000 square feet of living space, including a kitchen and washer-dryer. The Oceana Palms is a small, intimate resort right on the beach of Singer Island in West Palm Beach. It looks and feels like any other high-end Marriott resort: you get kids’ clubs, activities and programming, dining, pools and exercise rooms, and beach access. There are two towers in Oceana Palms: the Sunrise Tower and the Sunset Tower. At first glance, it appears that the Sunrise Tower, which is closest to the beach, is the obvious choice. However, thanks to great architectural design, both towers have ocean views. And some villas in the Sunset Tower have larger balconies. All villas at Oceana Palms are the same: two-bedroom units with everything you need, right down to the whisk in the kitchen. You’ll find laundry soap next to the washer, dish towels and plastic garbage bags, and hair dryers and shampoo. Sometimes, when families rent vacation homes or units, they don’t know what will be waiting for them. We had one unfortunate trip to a vacation home in which we discovered the ‘full kitchen’ lacked an oven! At Oceana Palms, everything is here. You also get two full bathrooms, one on which has a walk-in shower and the other of which has a large tub. Free wifi is available in the rooms and across the resort. The photo below shows a view from a Sunset Tower villa. Get up-to-date room rate information here. Oceana Palms boosts ideal beach access…the surf and sand is just steps away past the pool area. At the beach equipment stand, check in with Tony, who can hook you up with snorkel gear, boogie boards, and cabanas. Otherwise, lounge chairs are free for guest use. I split my time happily from beach to pool (which older kids could do on their own quite safely). In the pool area, you’ll find a zero-depth entry area for young kids, plus a splash zone. On the other end, a lap pool is situated in a quiet corner, and additional pool space occupies the area in-between. Oceana Palms schedules quite a bit of daily activity, with DJs, movie nights, and lessons in everything from crocheting to guitar (a staff member actually learned guitar in order to teach it). If you’re an activities person, you’ll find as much here as you would in an all-inclusive resort. However, if you want a quieter environment, it is possible to escape it. For additional entertainment, the resort has small details that go a long way. 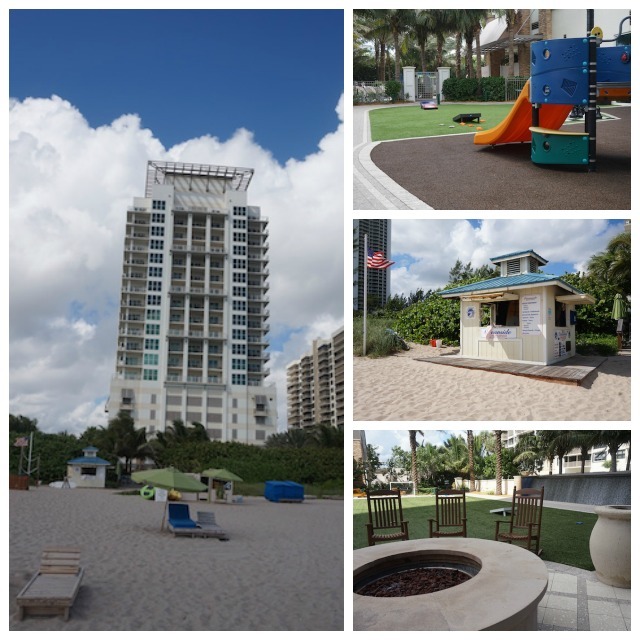 Throughout Oceana Palms, you’ll find ping pong tables, pool tables, lawn games, BBQs for guest use, and a large, fenced play area for young kids. My children spend hours at simple entertainment venues like this! Oceana Palms has a drop-in dedicated kids’ club space and a teen space, both of which are fun and inviting…and casual, which is nice for families on vacation. There is a casual dining Marketplace, plus poolside Reflections, both good for burgers, sandwiches, and drinks. You won’t find upscale dining on site, but that’s what your full kitchen is for: I recommend shopping before arrival and making many meals in your villa. You’ll want to venture off-site while at Oceana Palms. We took a short drive off Singer Island to Jupiter Beach, where to toured the historic Jupiter Inlet Lighthouse. The guided tour includes a walk up the many spiral steps to the top of the lighthouse, where amazing views await, and a stop in the small but well-done museum. Pair your excursion to the lighthouse with lunch at Guanabanas, a waterfront bar and grill located adjacent. Guanabanas is more than a restaurant; it’s a full dining experience with the best ambiance I’ve seen for a classic Florida feel. The whole place is outdoors, with vegetation, overhangs, and straw roof shelter. For another night out, consider heading to the Sailfish Marina on Palm Beach Shores. Part fish market, part marina, and part upscale seafood restaurant, Sailfish has something for everyone. The large building is fairly loud, which means kids will fit right in, and when they get squirrelly, take them outside to the marina, where they can purchase fish food to throw into the water. Wait for the feeding frenzy to begin! Marriott’s Oceana Palms is located at 3200 North Ocean Drive, Riviera Beach, Florida. It’s just over the bridge on Singer Island, 15 minutes from the West Palm Beach airport. Where do you stay in West Palm Beach? Would you consider trying a Marriott Vacation Club villa? As I disclose whenever applicable, my stay with Oceana Palms was hosted, for the purpose of review. All opinions are my own. Looks more than amazing – looks like a wonderful place to stay! Will bookmark! I love having a kitchen when traveling, especially with kids! I’m a sucker for a light house. Thanks for the recommendation!